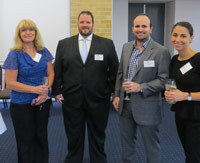 The Department of Accounting and Corporate Governance head, Professor Philomena Leung, launched the new PACE unit ACCG315, Accountants in the Profession at a networking event held on Thursday 27th February 2014. Developed by Dr Rahat Munir, Senior Lecturer in Accounting and Corporate Governance, the unit was created in conjunction with industry partners to help undergraduate accounting students understand what life as an accountant or business professional will be like. The idea is to invite industry professionals to come in and deliver presentations that capture the breadth, scope and challenges of the accounting profession. These presentations will help students become familiar with regulatory, cultural and technological issues that affect accountants and the accounting profession across a variety of sectors, and will give students an opportunity to put the lessons learned from industry partners into practice. ACCG315 will also help students develop critical and professional employability skills and introduce them to the behaviours and expectations in a professional business environment. The launch was an opportunity for industry guest speakers to meet each other and network with senior academics from the Faculty of Business and Economics and the University. It is believed that both students and industry partners will greatly benefit from involvement in this new initiative from the Department of Accounting and Corporate Governance. Last Updated: 2014-03-20 09:39:34 by Emily Inglis .